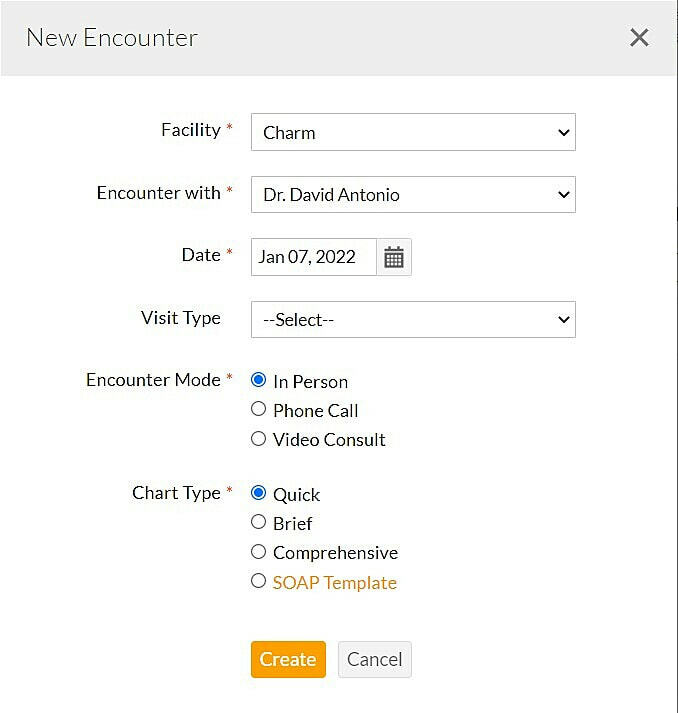 A new consultation can be created from the Home page by typing the Patient Name/ID in the search bar, which will give options to start an encounter, or from the Patient Dashboard by clicking the '+' on top bar and selecting 'Encounter' option. There are 4 ways in which you can create the consultation chart. To create a 'Quick Encounter' follow the steps given below. 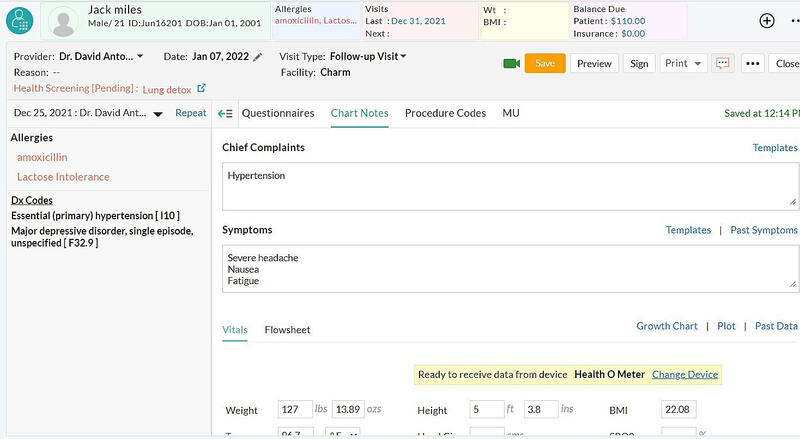 Select the patient from the list and go to the patient dashboard. Click on '+' on top and select 'Encounter' option. A window will appear on the screen asking to select the type of consultation. Click on 'Create' to continue with the quick consultation. Once you finish charting, click on 'Sign' to sign the chart note. To create a 'Brief Encounter' follow the steps given below. Click on 'Create' to continue with the brief consultation. Click on '+' top and top select 'Encounter' option. A window will appear on the screen asking to select the type of consultation. Click on 'Physician Notes' option to enter detailed notes about the patient. Choose the name of the SOAP template. 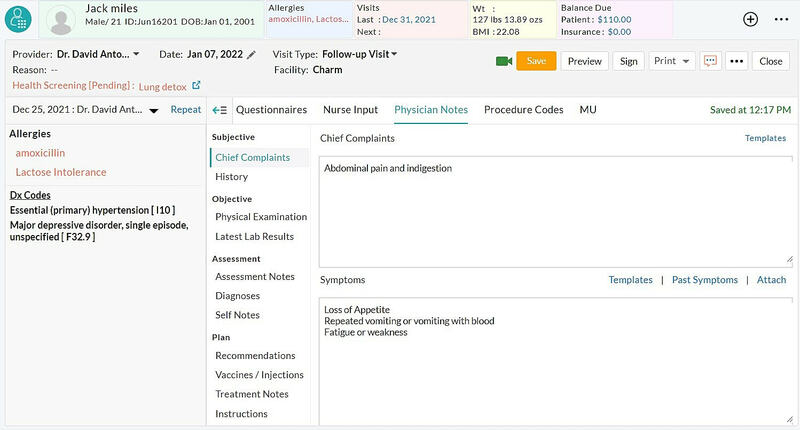 Once the template gets loaded in the chart, you can enter the notes about the patient. By default, the unsigned encounters will be listed. 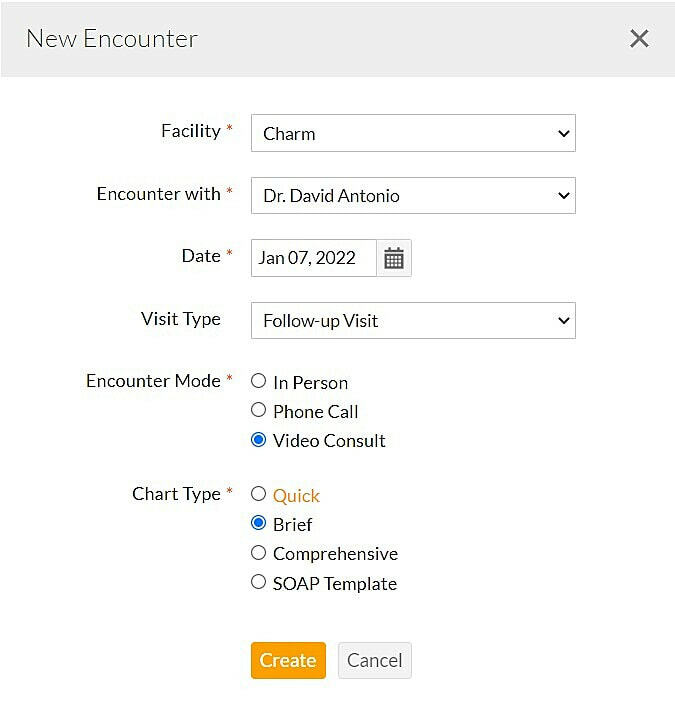 Select the encounter of a particular patient that you wish to submit for review. Click on 'More Options' (...) icon and select 'File for Review' option. 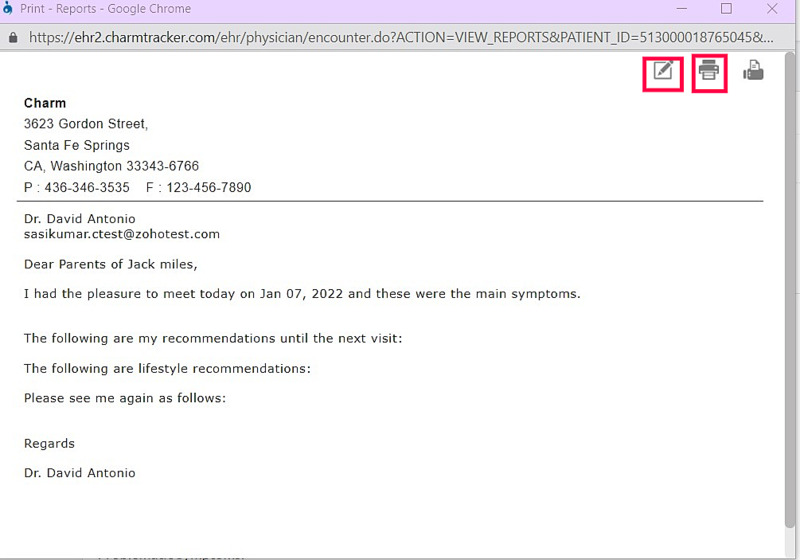 A popup will open, asking you to choose a physician's name to whom you want to file the chart note for review. Select the physician name and click on 'Submit' to file the chart for review. Go to 'Home' page and click on 'Chart Notes' icon. The following screen opens up. Select a chart note to review its content. Once you have review, click on 'Sign' to finalize the chart note. 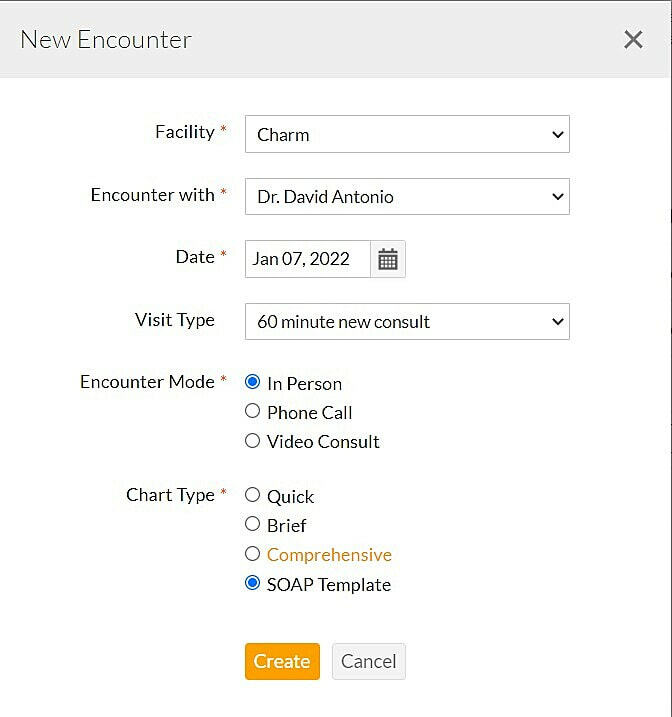 Click on the 'Chart Notes' icon and select the chart note of a patient, you wish to create a referral letter for, and click on 'Reports' button. Select 'New Report' and choose a referral template and click on 'Generate' to generate the referral letter. Referral letter will open up with the medical condition of the patient. If you wish to edit the referral report, you can use the 'Edit' icon. You can print the referral letter by clicking the 'Print' icon. 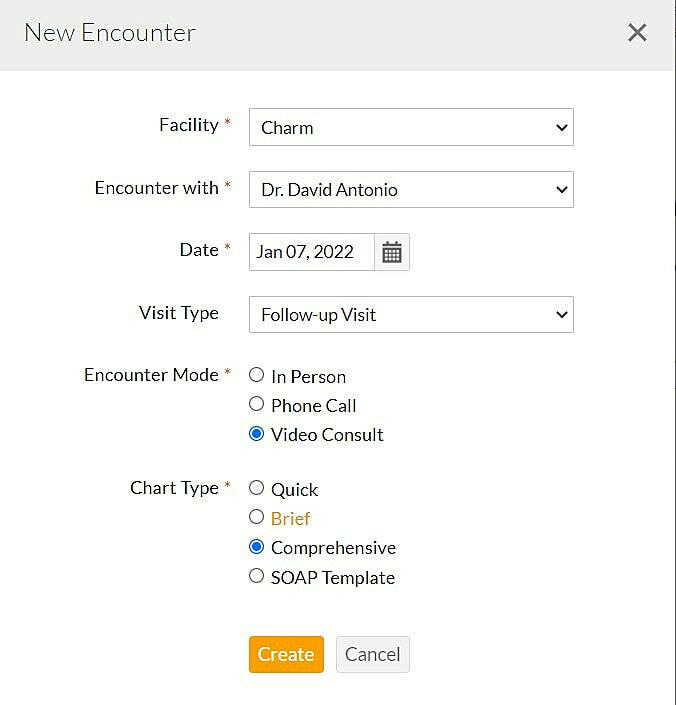 Followup appointments for the patients can be created at the end of the consultation by following the steps given below. Open the chart note and scroll down to the end of the note and click on 'Add Follow up' link. 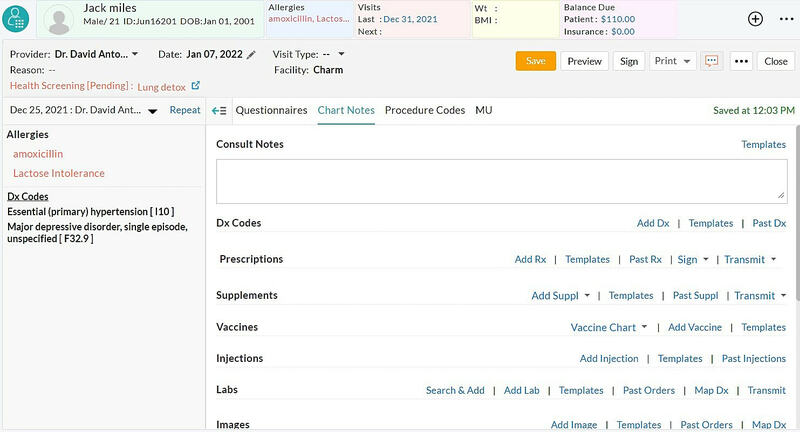 Recommend the type of followup, viz., Office Visit, Lab Test, Procedures, etc., and add a date. Click on 'Add' to add the followup to the chart note. 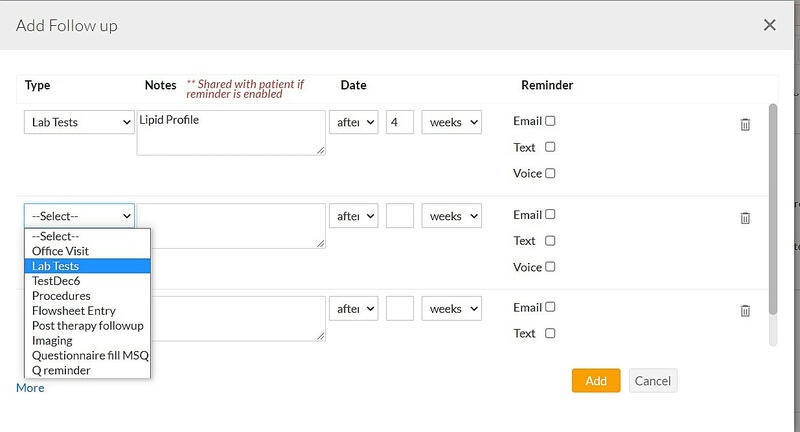 On configuring this, reminders will be sent to the patients about the follow up visits.